Anthem of the Seas has been delivered to Royal Caribbean by german shipbuilder Meyer Werft. The cruise ship which is the second ships in the Quantum class for Royal Caribbean has been delivered to Royal Caribbean by Meyer Werft at a ceremony in Bremerhaven, Germany. The cruise line is now in total control of the vessel and final fittings for the large vessel are now complete. The 168,600 gross ton cruise ship was handed over on April 10th. Anthem of the Seas is one of the most technical advanced cruise ships along with sister ship Quantum of the Seas. Meyer Werft states that the ship features highly energy-efficient systems, optimised hydrodynamics, heat recovery, an effective underwater paint coating, a state-of-the-art exhaust gas treatment plant (hybrid scrubber) as well as energy-saving LED lighting systems. The ship will go head to head with new ship P&O Britannia sailing out of Southampton UK but both vessels will offer a different style of cruising. The ship will depart from Bremerhaven to Southampton on 14 April 2015. Emma Wilby, travel agent, from Sunderland, U.K., is the Godmother for the world’s newest and most advanced cruise ship Anthem of the Seas. Upholding a timeless maritime tradition, Ms. Wilby will officially christen Anthem of the Seas and perform a special song for more than 1,300 invited special guests and dignitaries at the ship’s inaugural ceremony in Southampton, U.K., on April 20, 2015.Designed to revolutionize the industry, Anthem of the Seas will sail its inaugural season from Southampton before the ship repositions to its permanent homeport of New York in November. 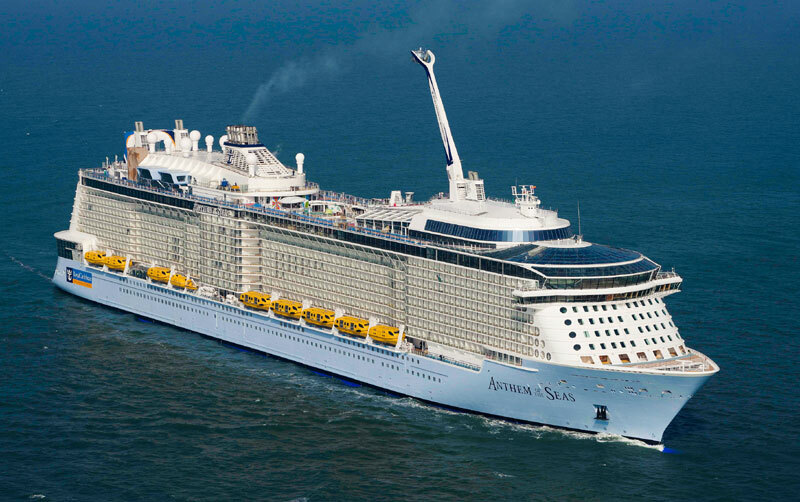 Anthem of the Seas will carry 4,180 guests and 1,550 crew members, passengers will be able to enjoy the very best innovative features at sea including the North Star, SeaPlex, Ripcord by iFLY and Two70.